David H. Klinges, vice president in charge of shipbuilding, Beth- lehem Steel Corporation, Beth- lehem, Pa., recently announced a reorganization of the department, effective December 1, 1979. Continuing to head the ship- building executive offices are Mr.
Klinges and John C. Estes, assist- ant vice president. Carriers, the B.C. Towboat Own- ers Association, and any other persons interested in the devel- opment of the towboat industry. Sciences, Patricia Bay. The con- ference fee includes all aspects of the main program, ladies pro- gram, cost of lunches, hospitality suite, cocktail party, banquet, and dance. The cost of accommoda- tions and any other meals is not included. The fee will be $125. Street, Vancouver, B.C. V6G 2V3. Herbert I. Freinberg becomes general manager of operations and facilities, Francis J. Long becomes general manager of hu- man resources, and Thomas F.
Robinson becomes general man- ager of technical services. S. Cohen, superintendent of esti- mating and pricing; Allan F.
George L. Bowen, manager of la- bor relations, safety and workers' compensation, and equal employ- ment; Mary S. Murphy, admin- istrative manager of salary and office administration; Wendell O.
Gunderson, superintendent of per- sonnel services, and Ruth E.
Thompson, administrative assist- ant for public affairs. Mr. Robinson will head the or- ganization within the shipbuild- ing department that has been known as central technical divi- sion. H. Bevan is assistant manager of ship repair sales, Robert W. Mil- ler is manager of industrial prod- ucts sales, Richard H. Jones is assistant manager of industrial products sales, Bradford J. Sibley is sales engineer, John J. Hef- fernan is manager of contract administration, and James W.
Bramblet Jr. is assistant manager of contract administration. David T. Cianelli will continue as legislative liaison in the Wash- ington, D.C., office. Resins Corporation's factory-trained and certified representatives. CHOCKFAST assures reliable, permanent alignment—without machining founda- tions and bedplates—and without any corrosion or erosion problems. Shipping—for operation at temperatures to 80°C ( 170°F) — and by all major classification societies. Technical services and application supervision are avail- able...throughout the world...from Philadelphia Resin's specially trained, certified representatives. 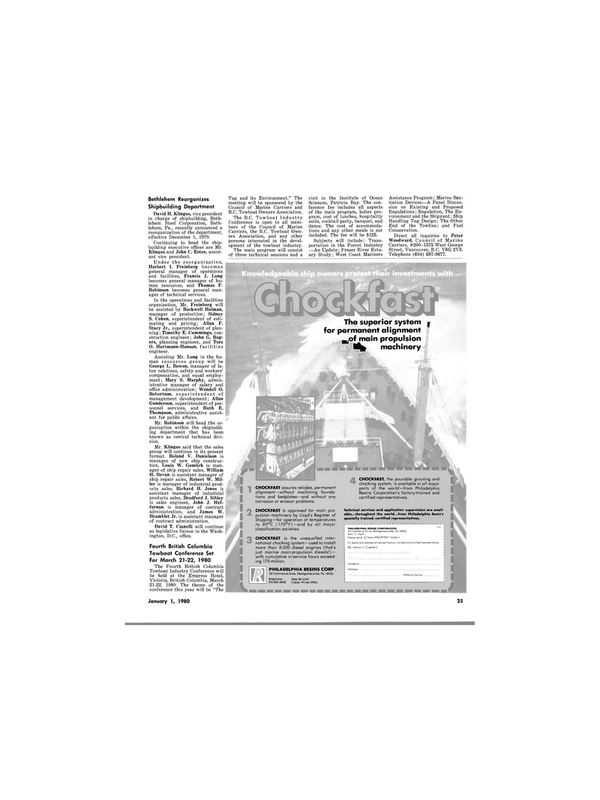 Please send • New CHOCKFAST bulletin CHOCKFAST is the unequalled inter- national chocking system —used to install more than 8,000 diesel engines (that's just marine main-propulsion diesels!) — with cumulative in-service hours exceed- ing 175-million. n Name and address of nearest factory-trained and certified representative.